It’s no secret that the future of organisations is employee-centric. Leaders are fast realising that it serves them to put their employees first. When employee satisfaction and well-being is a top priority, it’s likely they will be happy at work. And happy workers are the reason for happy customers. Organisations cannot succeed without the hard work and dedication of their employees. That being the case, it’s critical that companies invest in resources to ensure their workers feel taken care of, in every respect. Why the Whole Human being? If the average person spends 90,000 hours at work over their lifetime, this leaves us with a growing need to ensure that we look forward to waking up and going to work every day. In his TEDx talk, Mark Robbins stresses that for us to be fulfilled, we need to be able to bring our whole selves to work. All of who we are. All our skills, aspirations, dreams and desires, fears, doubts and insecurities. Today’s workforces are becoming more complex than ever, comprising of multiple types of workers stemming from multi-generations and residing in global locations. To increase employee wellbeing as well as organisational success, organisations are going to have to start accommodating the diverse pool of talent and growing millennial representation in organisations. This will involve leadership having an employee- first mentality. But they cannot achieve this unless they are concerned with all aspects of the employee. The HR360 Ltd model – The Five Pulse Model - has been developed as a guide towards a more balanced, integrative employee experience, which we have found, inevitably leads to greater profit, productivity, and performance in organisations. To compliment these 3 P’s, we have come up with a 4th - a pulse. Organisations typically use pulse surveys to gain insight into the health of a company. These surveys are used to create more engaged employees. While engagement is an important metric for leadership, it’s only one part of the bigger picture. We’ve taken this pulse to the next level. 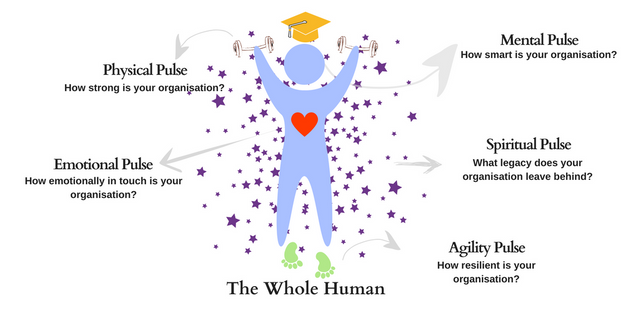 For us, pulse implies vitality and is used as a measure of an organisation's liveliness. It is no longer good enough to focus on a single aspect of human nature to understand how employees can achieve their potential and enable an organisation’s success. Much in the same way the body needs to maintain homeostasis for optimum health and functioning, so too does an organisation require balance to perform at its best. An organisation can only be balanced when its employees are holistically supported - in an emotional, physical spiritual, mental and agile respect. By developing the whole human inside your organisation, you can turn those 90 000 days into the best days of an employee’s life - thereby helping an organisation achieve, greater profit, productivity and performance. Emotional Pulse: How safe do employees feel? Do your employees want to build relationships with colleagues? Mental Pulse: Are employee’s technical capabilities being used to their fullest extent? Are employees being pushed beyond their boundaries to achieve? Agility Pulse: Are employees able to respond quickly and efficiently to internal and external change? Are employees given flexibility to work in remote locations? Physical Pulse: Are employees’ physical and financial well-being been taken care of? Does the organisation’s design facilitate the wellbeing of employees? Spiritual Pulse: Does the employee’s work benefit local and global society? Do employees feel like they are doing work that’s meaningful? Stay tuned as we use the next few months to delve deeper into the makeup of each pulse and what your organisation can do to stay equipped to handle complexity and change.